Provide comfort for the family of Konstantina Panagoulias with a meaningful gesture of sympathy. Passed away peacefully on Tuesday, March 19, 2019, surrounded by her family in her 94th year. Loving wife of the late Yianni. Beloved mother of Athanasios & his wife Eleni, Mary & her husband Andy, Georgia & her husband Tim, and Danny & his wife Rosina. Cherished Yiayia of Yianni, Kosta, Estelle, Tina, Phillip, Patricia, Christina, Steve, Tina, Danielle, & Alexandra & great-grandmother to Mikhail, Anastasia, Evangeline, Melania, Athan, & two angels on the way. Konstantina will also be sadly missed by her brother, sister, & many nieces, nephews, & friends. The family will receive friends at ST. NICHOLAS ORTHODOX CHURCH 77 Craiglee Drive., Toronto on Thursday, March 21 from 4-9 p.m. A funeral service will be held on Friday, March 22 at 10 a.m. at St. Nicholas Orthodox Church. Interment to follow at Beechwood Cemetery 7241 Jane Street., Toronto. 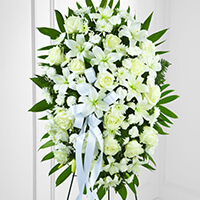 Consider providing a gift of comfort for the family of Konstantina Panagoulias by sending flowers. We encourage you to share your most beloved memories of Konstantina here, so that the family and other loved ones can always see it. You can upload cherished photographs, or share your favorite stories, and can even comment on those shared by others. Sending our condolences during this difficult time. We are so sorry for your loss. If only we had eyes to see that all of heaven is celebrating, as Dina went into that holy place. I know her spouse Yanni is waiting for her. May her memory be forever eternal! Georgia and family our heart felt condolences on your loss. 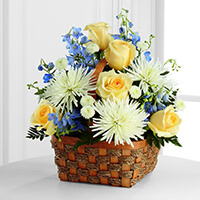 Your friends in Admin Centre and Payroll purchased the The FTD Heavenly Scented Basket for the family of Konstantina Panagoulias. Martire Family purchased the The FTD Exquisite Tribute Standing Spray for the family of Konstantina Panagoulias.